Over the past several years, I've gotten so many different questions about my weight loss, gain, maintenance, loose skin, running, blogging, etc. Out of all the questions that I get, the number one most frequently asked topic is about binge eating. If nothing else, getting asked questions about it (namely, how to prevent it) has made me realize that there are SO many of us out there! I always felt so ashamed of binge eating, but once I wrote publicly about it, I realized that I am certainly not alone. It's no secret that I have struggled with binge eating disorder (BED) since I was a kid. I remember getting home from school and making an enormous bowl of popcorn loaded with butter. After polishing that off, I would chase it with a huge bowl (or, more likely, two or three bowls) of ice cream with chocolate syrup and peanuts. And later, I would eat dinner with my family. I remember sneaking food to binge eat when I was at my grandma's house, too. She used to have boxes of Kudos bars, which is what started my love affair with chocolate and peanut butter. I would sneak them one by one, eating them as quickly as possible so nobody would see, until they were gone. She also had fruit snacks (the original ones that tasted so good!) and I would eat several packs of those. I always felt ashamed of my eating habits. At the time, I didn't know that I had the classic signs of binge eating disorder (actually, back then, it wasn't even a labeled eating disorder). My parents were never strict about what I ate, so the bingeing wasn't a rebellious thing. I just somehow sensed that what I was doing was wrong in some way. The bingeing became its worst when my kids were both very young. Bedtime for them meant binge-time for me. As soon as their heads hit their pillows, I was in the pantry, pulling out anything that sounded good. It was my way of relaxing after a day of looking after two young kids. I would sit on the couch, watching TV, and eating until I was stuffed. Then I would go to bed miserable with myself, vowing that I wouldn't do it the next day. 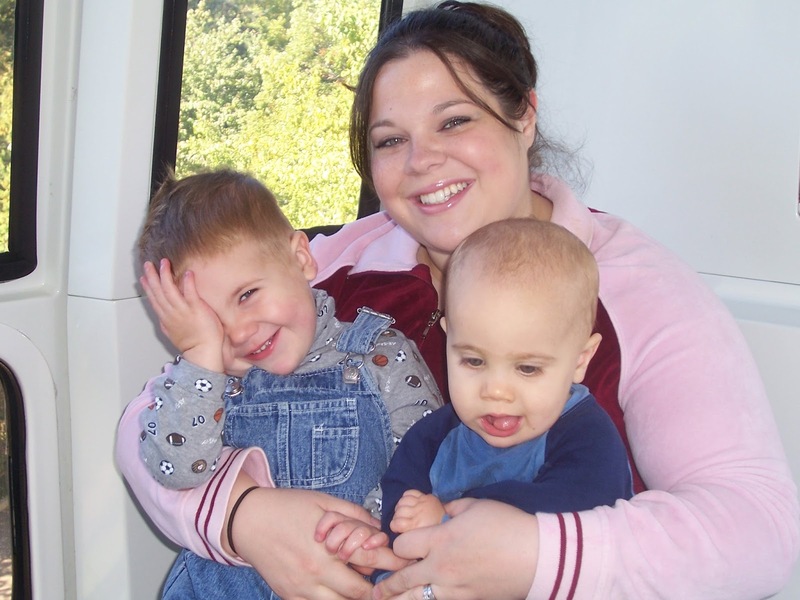 My weight climbed higher and higher, until I found myself weighing 253 pounds and unable to be an active parent. Most people have episodes of overeating now and then (think Thanksgiving, for example). But overeating is not the same as binge eating. Overeating every now and then is normal, and in most cases, not harmful to one's health. Binge eating, on the other hand, can contribute to obesity and all the related conditions resulting from it; it also can cause psychological issues such as depression. I eat well all day long, measuring my portions, counting my Points. Getting dinner ready is a little stressful--I'm hungry; the kids are looking for something to eat and asking when dinner will be ready; Joey is waiting to be fed; Jerry gets home from work; and I haven't figured out exactly what to make for dinner yet. I'm really tempted to just order a pizza, but I grab a few ingredients to throw together a quick meal. We sit down to eat, and I don't like what I've put together, but I eat it anyways because I'm starving. After dinner, I'm just not feeling satisfied, so I decide to have a small sweet treat to end the meal. We don't have any real sweets in the house, so I grab about a tablespoon of chocolate chips and eat those while I'm standing in the pantry. I take a load of laundry from the dryer to put it away, and the chocolate was so good that I decide to take another tablespoon as I pass by the pantry again. One more time won't hurt. After I put away the laundry, I decide I better add the chocolate chips to my food log. I realize that I had eaten over 6 Points of chocolate chips, but I still wasn't satisfied. I look for something with more substance, that I can actually sit down and enjoy eating. I don't find anything that really sounds satisfying, so I grab the only snacky food that I can find--Goldfish. I pour some into a bowl, measuring them out so that I can log my Points, and sit down to eat them. I forgot how much I like Goldfish! They were so good that I decide to eat some more. Going over my Points for the day won't really hurt that bad, right? I ran this morning, so I'll just use the Activity Points that I earned. A glass of wine sounds good, too. I pour a glass of wine and a larger portion of Goldfish. About halfway through my wine, the Goldfish are gone, so I refill my bowl. The wine made me feel more relaxed, and I think I shouldn't worry about eating too much now and then--everybody does it! I was already over my allotted Points for the day, so a little more won't hurt. By now, the salty Goldfish made me want something sweet again, so I have more chocolate chips--this time taking a small handful at a time. I decide to just skip trying to log my food, because I've already blown my Points, so what does it matter? And since I'm not logging my food, I might as well finish off the chocolate chips so they aren't there to screw me up tomorrow. ...and so on. Maybe the above wasn't the greatest example, but it just shows how irrational our thoughts can be sometimes. "I've already blown it, so I might as well just keep eating" is something that I used to tell myself all the time! 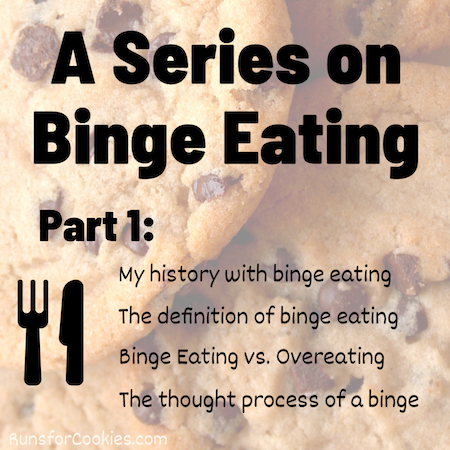 Click here to go to A Series on Binge Eating, Part 2. I can so relate to this! Thank you for sharing. I, too, have BED. I have started tracking on MFP, and I have been able to control it a little better. I am trying not to restrict calories too much, and am allowing myself some treats so that I don't feel the urge to binge. I can remember going to 3 different Publix grocery stores for a cake that I had been craving. Once I went to three fast food restaurants to get my favorites from each, and ate it all in the car so I wouldn't have to in front of my family. I know you don't open up yours, Katie, but MFP chastity0921 if anyone wants to be friends. Just write me a message with the request. Thanks for being so vulnerable. It's nice to know that I am not along in this! "I've already blown it..." I have said this so many times. I am trying to remove it from my vocabulary! This was the perfect scenario. It has happened so many times to me just like that. You did fantastic on this post! You should write a book about your personal experience. Boy does that stinkin thinkin sound familiar! Sounds like me during PMS week. It's crazy because I don't feel hungry but I want to eat anyway and the saltier the food the better!! I've gotten better at resisting the urge to eat everything in the kitchen as I've gotten older. When I was in my teens and twenties though you did not want to stand between me and that bag of chips! I have been walking 2 miles 3 times a week but it doesn't make a difference when I binge 2-5 times a week. I'm so glad you are doing this series. I want control over my life. Your description of a binge is spot on for me! Longing for something that no food will satisfy, yet we keep eating and eating and don't even really enjoy it--we just continue to stuff in whatever we can get our hands on. My childhood binge patterns were also scarily similar and, like you, I wasn't raised in a home with overly strict attitudes about food. I, too, couldn't wait for my kids to go to sleep, so much so, that I would chase Charlie back to his bed when, after an hour of stories, would say he couldn't sleep. All so I could raid the snack cabinet. One day, after the weight loss, while walking the track with big Charlie, I asked him what he thought of my overeating and the Twinkies or Oreos or Little Debbie's, etc., going missing and he just said "I thought the kids ate them." It's an addiction you truly can't hide, no matter how much of a ninja you may think you are opening up a plastic wrapper. I didn't realize there was a diagnosis of BED but my story is so similar. My home didn't have any "junk" food, but I would eat a bag of apples. Then, when I'd go to my aunts, I would sneak kudos, fruit snacks and rice Krispy treats and eat them so quickly and privately. Once I began driving, I'd go in a convenience store and buy a baked good, candy, chips-- something from each category and in my brain hope the cashier thought I had a car load of people as I went along my drive and ate it all. I try not to have any junk in the house because I know I'll devour it but my husband wouldn't understand and in one night I'd eat all of the fruit snacks or little Debbie's he brought as treats. Two weeks ago I bought a package of creme horns- and ate them all, regardless of the fact they taste only like hydrogenated lard. That stopped my last binge, and I hope it will be my last for a long time. I'm back on MFP and perhaps this new knowledge of BED will help me sustain my will. Thank you for sharing. This is exactly what happens to me as well! Thanks for sharing. I thought for a long time that I just loved food and had poor self-control in this one area of life. I realized it was something worse when I was binging on saltine crackers. I was eating them so fast they were scratching my throat and I was actually having trouble breathing. I realized I was completely miserable, but I felt so out of control. I ate the entire sleeve and more. I was having similar binges almost every day. Nothing about what I was doing was bringing me any kind of happiness, even as I was eating. That was around the time I found this blog (and the Brain Over Binge book you recommended). I am 27 days binge-free, which I didn't think would ever be possible for me. Thank you for all that you are doing. Thank you. Oh my, thank you. You are so very brave. If I don't have BED, I've definitely had BE episodes. In another post you discuss why you transferred to calorie counting, your past success on the FIRST point program, and then how you've felt about the second one PPlus. I had the exact same thing happen. Lost amazingly on points. Couldn't stand PPlus. I've tried Smart Points for one month and can't lose, even with careful tracking and no exercise points. I KNOW how to eat healthy, but with no allowance for a treat or anything remotely close to one.... I am miserable. I quit two days ago. I haven't binged and I'm still observant, but I'm examining other options. It's your descriptions of what goes on in the head that really stick with me. I don't feel so alone I suppose. So thank you (again) for doing all of this. Excellent post ... thank-you Katie! Hmmm, I thought that I was the only one who thought that peanut butter, chocolate chips and oats were meant to be tossed together and inhaled (in private). Thank-you for sharing because it allows the rest of us to be more vulnerable as we attempt to lead a healthier life. The process is long and slow; however, it helps when we recognize that we are not alone in our journey. I struggled with the guilt/shame of binging for 30+ years. Watched my father eat EVERY thing in the fridge in a frantic session and soon followed the same pattern. After the devastation of the sudden death of a sleeping loved one (went to bed fine, never woke up) and an attack on my job, I sought help. My internist placed me on Welbutrin to cope with the PTSD of the attack and depression from the sudden death of my 19 year old nephew. The Welbutrin helped me cope better and included a bonus side effect: I realized after 2 months, that I had not raided the fridge/pantry or gone through a drive-thru and ordered 3/4 meals since beginning the meds. It's been a year and I cannot believe how easy it is to eat normally…I can eat normal calories and sleep without guilt! All those years I thought I was fighting my lack of self-control with my food habits when I was really fighting the chemicals in my brain. It was truly all in my head! Thank you for sharing Katie, I know it is not easy to be that honest about yourself. I have struggled with hiding food in my car for years. Buying a box of cookies or little debbies and eating them as fast as possible while I was driving because I didn't want to share with anyone and I didn't want anyone to know I was doing it. Every once and a while my husband would mention the empty box of Oatmeal Creme Pies in the trash and I would be so embarrassed. I had gone without binging for months until this last couple of weeks and I started hiding food in my car again. I'm not sure why. It has been 3 days since and your post is giving me hope to keep it going!! Amen, Katie. Been there, done that and still struggling at times. Thank you for writing this! I recognize a lot of the BED characteristics in myself lately, and it's definitely scaring me. I've been so frustrated with myself because I trained and ran a marathon, and I'm training for a second one, and yet I'm seeing the scale go up rather than down because of my binging. The "I've already blown it" line is all too familiar. Your story is basically my story, too. I lost nearly 100 lbs counting the original points. I never could transition to the new points plans. While I never stopped counting points, I learned how to cheat the system...and also started consistently rationalizing just going over by a "few" points each day. Or even worse, eating like a lunatic after I had already "ruined" the day points wise. On 12-17-15, I switched to counting calories on MFP because of you, Katie. It's been slow going while I try to figure out a calorie goal, but at least I feel like I'm doing something to stop and reverse the 30 lbs I've gained back. I'm also training to race walk a half marathon in April, as an injury ended my jogging days. My next goal is to start tracking my food intake on "cheat days" to hopefully prevent them from becoming total binge days. In the past, I've never made myself track on cheat days. That's the worst policy a binge eater could possibly have, and I'm done with it. I'm hopeful for the first time in a very long time!! Thank you! I had to chuckle to myself because (like another person noted) your post sounds exactly like me for a couple of days during my "mid period" ...I get all wigged out with hormones during the "ovulation" time rather than just a few days prior to the real deal. I always look at people who can have cookies or brownies or bags of chips in their houses and not devour it all in one go. I get those kinds of things specifically to binge on them. People say to just not keep that stuff in your home. But I have car keys, money and the knowledge of where stores are. I've actually changed out of pajamas on a dark, rainy Seattle winter night just to go get cookies. My phrase is usually, "I don't care." I don't care that I've eaten healthy all day. I don't care that I started exercising again. I don't care that I'm not hungry or that I don't really want whatever has just popped into my head. Now I HAVE to go get it and eat it all. My binges usually take a couple different forms. Either something has made the thought of some food--something I saw on the internet or a casual mention of some food by a co-worker--pop into my head and I resist the urge to think about it until I break down and go buy it. Or something happens and just like the feeling of being filled immediately with rage, I'm filled immediately with the urge to binge. I'm really looking forward to your third part because none of the usual suggestions I read to deflecting a binge has worked for me. I've not yet seen a therapist but I probably need to. Thanks for sharing your story. For sharing ALL your stories. I've actually started a couch to half marathon program and a lot of my motivation came from seeing you running. This sounds just like what I do. Such a wonderful post! Thank you for sharing. I look forward to the rest of the posts in this series. Is there an app you use to count your binge free days? I usually just lurk but had to comment. I really relate to this post. I'm pretty positive I have BED as well. I've felt that way my whole life, even as a child. Your description just hits the nail on the head! I'm currently on my own weight loss journey and have lost about 75 pounds. Anyway, I loved reading this and realizing I'm not alone! Thank you! You said "Maybe the above wasn't the greatest example" but it was perfect -- my thought process over and over again! I struggle with BED and feel like I will never be free of it. Your story makes me hopeful that I can change. I had a binge free day today and I'm hoping to make it the start of a binge free streak. Thanks for this post and all your others! Dude. This is so, so relatable. And from all the comments, too, I'm feeling quite reassured! Another thing I often think while bingeing is "I've earned this!" I've had a crappy day, and I know I *should* count calories or eat mindfully or honor my fullness, or whatever the thing is for me at the time. But that takes effort, and I want a night off to stuff whatever I feel like in my mouth, even after I'm totally full. I'll be better tomorrow. Thank you so much for sharing this, and to everyone else for commenting! Katie, thank you again for your honesty. I struggle with the exact same things you stated above. Your example was perfect - I can't tell you how many times I've thought "well, I've already ruined the day counting points, might as well finish off this bag of ___ and start fresh tomorrow". And then repeat the same behavior the next day. I still plan what I can binge on, that explains why have I still keep losing the same weight again and again. The example you gave at the end is something I experienced many times in college. It would always start out so innocent but I couldn't seem to control it in any way. It really is so crazy that everything you wrote I have experienced in some way. Planning binges, the constant thinking of food, etc. I've done it all. It is crazy to think how I lived a few years ago. I haven't binged in a long long time but sometimes I still think about doing it and I can't seem to figure that one out but most the time I realize it isn't worth it and that is the most rewarding feeling. I don't even need much convincing these days that nothing good comes from it. Thank you for sharing and I can't wait to read the next installments. I always use the term binge eater to describe myself but honestly, hand on heart did not realise that what I do would be classed as BED, I'm stunned. I feel so out of control most days and like you I can often (not always) go through the day eating half decent (by half decent I mean not bingeing but it will still be quick junk food that I eat) but at night I inhale my food as quickly as possible - I swear I don't even taste it. I eat to the point of feeling uncomfortable and yet continue to eat, I then eat to the point of feeling nauseous and where it's uncomfortable to move. I don't even stop there, I give it 20 minutes and then continue. I then go to bed feeling like a rubbish person, berate myself and then get up the next day and repeat the process. I am so ashamed because I do not know how to break this cycle. Been there, done that. Still doing it from tine to time. Both binging and overeating. I'm not ashamed anymore. I'm open about my stuggles, and anyways sitting right now at 227 pounds it's pretty obvious just looking at me. I did a bunch of therapies, read a bunch of book (really like Brain over Binge), went the OA way for a while.... The only thing that seems to make it better for me is to reduce my sugar consumption. The binges tend to diminish then. But I don't give up. I'll never give up. I'm only in the "before picture" phase right now, and I WILL get to a healthy weight!! Oh, and something else : for me, calories counting is binge inducing. Probably has something to do with anxiety (the fear of "not enough food" and then the feeling of "I will literally die of hunger"). Every time I've tried counting calories for the last 10 years, it ended up in a massive binge a day or two into it. So what works better for me is a structured plan of 3 meals a day without snacks and no sweets/desserts. Lost 60 pounds that way a couple of years ago. Regained it and am now back on the plan.